RunTri: Sold Out Ironman Races: How Many Choose Not to Race? Sold Out Ironman Races: How Many Choose Not to Race? Most north American Ironman races sell out on the first day of registration. After that, several hundred enter sold out races via a Foundation Entry, which double the fee, with 50% going to Ironman Foundation charities. With all the demand to enter these races, it's remarkable that hundreds ultimately will never reach the starting line. Of those who do start a north American Ironman, about 95% finish. 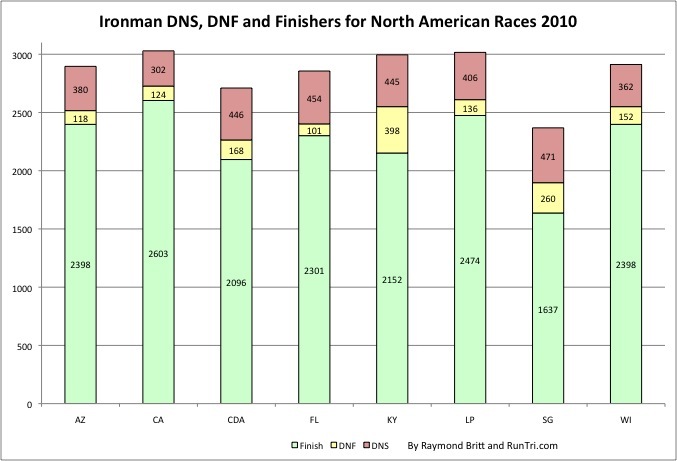 The exceptions in 2010 were Louisville and St. George, where several hundred triathletes did not reach the finish line.